"Treason": Origin Of the "Danites"
With the capitulation of Far West as outlined in the preceding chapter, General Lucas considered "the war" at that place at an end, and accordingly, with the exception of the troops he thought necessary to conduct the prisoners to Independence--his headquarters--and four companies to hold Far West, and five companies under General Parks sent into Daviess county, to receive the surrender of the people at "Di-Ahman," and take possession of their arms, the general disbanded the rest of his forces leaving the others designated above to report to General Clark, then drawing near to Far West, while he and General Wilson hastened toward Independence with their prisoners. our lives should be given us, and that whatever we may suffer during this our captivity, not one of our lives shall be taken." A prediction which was realized in the experience of the prisoners. The day before arriving at Far West, Clark learned that Lucas had disbanded his forces and was marching with his prisoners to Independence. He tried to intercept him with an order to deliver the prisoners to him at Richmond, but Lucas made good his determination to take the prisoners to Independence--his headquarters--where he kept them several days. They were finally returned to Richmond under guard commanded by Colonel Sterling Price, who put them in irons and guarded them day and night during the examination before Judge Austin A. King, which lasted seventeen days. "Silence, ye fiends of the infernal pit? In the name of Jesus Christ I rebuke you, and command you to be still; I will not live another minute and hear such language. Cease such talk, or you or I die this instant!" The first requires that your leading men be given up to be tried according to law; this you have already complied with. The second is, that you deliver up your arms; this has been attended to. The third stipulation is, that you sign over your properties to defray the expenses of the war; this you have also done. Another article yet remains for you to comply with, and that is, that you leave the state forthwith; and whatever may be your feelings concerning this, or whatever your innocence, it is nothing to me; General Lucas, who is equal in authority with me, has made this treaty with you--I approve of it--I should have done the same had I been here--I am therefore determined to see it fulfilled. The character of this state has suffered almost beyond redemption, from the character, conduct and influence that you have exerted, and we deem it an act of justice to restore her character to its former standing among the states, by every proper means. The orders of the governor to me were, that you should be exterminated, and not allowed to remain in the state, and had your leaders not have been given up, and the terms of the treaty complied with, before this, you and your families would have been destroyed and your houses in ashes. There is a discretionary power vested in my hands which I shall exercise in your favor for a season; for this lenity you are indebted to my clemency. I do not say that you shall go now, but you must not think of staying here another season, or of putting in crops, for the moment you do this the citizens will be upon you. If I am called here again, in case of a non-compliance of a treaty made, do not think that I shall act any more as I have done-you need not expect mercy, but extermination, for I am determined the governor's order shall be executed. As for your leaders, do not once think--do not imagine for a moment--do not let it enter your mind that they will be delivered, or that you will see their faces again, for their fate is fixed--their die is cast--their doom is sealed. I am sorry, gentlemen, to see so great a number of apparently intelligent men found in the situation that you are; and oh! that I could invoke the Great Spirit, the Unknown God, to rest upon you, and make you sufficiently intelligent to break that chain of superstition and liberate you from those fetters of fanaticism with which you are bound--that you no longer worship a man. I would advise you to scatter abroad, and never again organize yourselves with bishops, presidents, etc., lest you excite the jealousies of the people, and subject yourselves to the same calamities that have now come upon you. You have always been the aggressors--you have brought upon yourselves these difficulties by being disaffected and not being subject to rule--and my advise is, that you become as other citizens, lest by a recurrence of these events you bring upon yourselves irretrievable ruin." Brigham Young, who was present when the speech was made, says that in addition to the above General Clark said that "Mormons" must not be seen as many as five together: "If you are," said he, "the citizens will be upon you and destroy you" * * * There was no alternative for them but to flee; that they need not expect any redress, for there was none for them. The saints were also compelled to sign away their property by executing a deed of trust at the point of the bayonet which they did, amid the frantic joy of the mob. After the first group of prisoners consisting of Joseph Smith and his several associates were returned to Richmond, General Clark sought diligently through military codes for authority to try them by court-martial. He even sent to Fort Leavenworth, then a United States military post, for information on the subject, and also asked that the opinion of the attorney-general of the state be forwarded to him in relation to the mater; but apparently he could get nothing that would justify his desire for a court-martial trial. So persistent was he in this proceeding that he was sharply reproved by Governor Boggs himself. In a communication of November 19th, the governor said: "You will take immediate steps to discharge all the troops you have retained in service as a guard and deliver the prisoners over to the civil authorities. You will not attempt to try them by court-martial, the civil law must govern. * * * The officers retained to serve on court-martial will also be discharged." The testimony taken before Judge King is published by the legislature of Missouri, in its collection of Documents, Correspondence, Orders, etc., and makes altogether sixty-five pages of matter. The "evidence" is made up almost exclusively of the statements of apostates, and the saint's bitterest enemies among the "old settlers;" and of the sixty-five pages which it fills, less than four is occupied with testimony for the defense. The court found sufficient cause for holding most of the prisoners on one or the other of the offenses charged, and held them to appear before the courts in the respective counties where the crimes were alleged to have been committed. Joseph Smith, Lyman Wight, Caleb Baldwin, Hyrum Smith, Alexander McRae, and Sidney Rigdon were held for treason, against the state, murder, burglary, arson, robbery and larceny; and were committed to prison without bail in Liberty, Clay county, for want of a suitable jail in Caldwell county. Parley P. Pratt, Morris Phelps, Luman Gibbs, Norman Shearer and Darwin Chase, charged with murder, and hence not bailable, were confined in Richmond prison, also for want of a suitable jail in Caldwell county. About twenty of the other prisoners were held on various charges, and were either admitted to bail or allowed to go upon their own recognizances. Before the time set for the trial of their cases, they and their bondsmen were compelled to leave the state. The testimony which was most effective in holding these men to investigation before grand juries was the sworn statements of apostates--Dr. Sampson Avard, John Corrill, Reed Peck, W. W. Phelps, George M. Hinkle, John Whitmer, Burr Riggs, and other less prominent. It is in this testimony and principally in the statement of Dr. Avard, that the existence of the "Danites" in the "Mormon" church is affirmed. 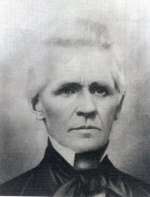 Avard declared that about four months before the date of his testimony,--which would be in the month of July, 1838--"a band called the `Daughter of Zion' (afterwards called the `Danite Band'), was formed of the members of the Mormon church, the original object of which was to drive from the county of Caldwell all those who dissented from the Mormon church; in which they succeeded admirably and to the satisfaction of all concerned." "In the name of Jesus Christ, the Son of God, I do solemnly obligate myself ever to conceal, and never to reveal, the secret purposes of this society called the `Daughter of Zion.' Should I ever do the same, I hold my life as the forfeiture." "Whereas, in all bodies laws are necessary for the permanency, safety, and well-being of society, we, the members of the society of the `Daughter of Zion,' do agree to regulate ourselves under such laws as, in righteousness, shall be deemed necessary for the preservation of our holy religion, and of our most sacred rights and of the rights of our wives and children. But, to be explicit on the subject, it is especially our object to support and defend the rights conferred on us by our venerable sires, who purchased them with the pledges of their lives, their fortunes, and their sacred honors. And now, to prove ourselves worthy of the liberty conferred on us by them, in the providence of God, we do agree to be governed by such laws as shall perpetuate these high privileges, of which we know ourselves to be the rightful possessors, and of which privileges wicked and designing men have tried to deprive us, by all manner of evil, and that purely in consequence of the tenacity we have manifested in the discharge of our duty towards our God, who has given us those rights and privileges, and a right, in common with others, to dwell on this land. But we, not having the privileges of others allowed unto us, have determined, like unto our fathers, to resist tyranny, whether it be in kings or in the people. It is all alike unto us. Our rights we must have, and our rights we shall have, in the name of Israel's God.
" Art. 1st. All power belongs originally and legitimately to the people, and they have a right to dispose of it as they shall deem fit; but, as it is inconvenient and impossible to convene the people in all cases the legislative powers have been given by them, from time to time, into the hands of a representation composed of delegates from the people themselves. This has been the law, both in civil and religious bodies, and is the true principle.
" Art. 2nd . The executive power shall be vested in the president of the whole church and his counselors. "Art. 3rd. The legislative powers shall reside in the president and his counselors together, and with the generals and colonels of the society. By them all laws shall be made regulating the society.
" Art. 4th. All offices shall be during life and good behaviour, or to be regulated by the law of God.
" Art. 5th . The society reserves the power of electing its own officers, with the exception of the aids and clerks which the officers may need in their various stations. The nomination to go from the presidency to his second, and from the second to the third in rank, and so down through all the various grades. Each branch or department retains the power of electing its own particular officers.
" Art. 7th . There shall be a secretary, whose business it shall be to keep all the legislative records of the society, also to keep a register of the names of every member of the society; also the rank of the officers. He shall also communicate the laws to the generals, as directed by laws made for the regulation of such business by the legislature.
" Art. 8th . All officers shall be subject to the commands of the captain general, given through the secretary of war; and so all officers shall be subjects to their superiors in rank, according to laws made for that purpose.'" This "constitution" is disappointing after hearing its murderous nature roaring so loud and thundering in the index supplied by the testimony of Avard, Marsh, et al. One would naturally expect to find the "constitution" more sanguinary than it is after all that has been said by the exploiters of it. Now follows the account of Avard's "Danite Band" organization condensed from Joseph Smith's History of the Church. "Doctor Sampson Avard had been a member of the church but a few months. He was one of those restless, ambitious men who desire to become great, and lord it over their fellow men. Possessing neither the intelligence nor the integrity to rise to positions of honor and trust in the church by open, fair means, he resolved to become a leader by craft and villainy. He employed the art of flattery in his conversations with the brethren, appointed frequent meetings at his own house which was guarded by one or more of his trusted associates, who would give him a sign if any one approached whom he had not trusted. With an air of mystery he would intimate that he had been appointed by the heads of the church to accomplish some important work of a secret character, and at last put those whom he had won by his flattery, under an oath of eternal secrecy, not to reveal anything that he should communicate to them. "This lecture of the doctor's revealed for the first time the true intent of his designs, and the brethren he had duped suddenly had their eyes opened, and they at once revolted and manfully rejected his teachings. Avard saw that he had played and lost so he said they had better let the matter drop where it was. As soon as Avard's villainy was brought to the knowledge of the president of the church, he was excommunicated, and was afterwards found making an effort to become friends with the mob, and conspiring against the church * * * And here let it be distinctly understood, that these companies of tens and fifties got up by Avard, were altogether separate and distinct from those companies of tens and fifties organized by the brethren for self-defense, in case of an attack from the mob. This latter organization was called into existence more particularly that in this time of alarm no family or person might be neglected; therefore, one company would be engaged in drawing wood, another in cutting it, another in gathering corn, another in grinding, another in butchering, another in distributing the meat, etc., etc., so that all should be employed in turn, and no one lack the necessaries of life. Therefore, let no one hereafter, by mistake or design confound this organization of the church for good and righteous purposes, with the organization of the `Danites,' of the apostate Avard." This latter and legitimate organization was revived at the breaking up and evacuation of Nauvoo, some years later, and under it the great exodus of twenty thousand people from Illinois to the Salt Lake Valley was conducted. "We have learned also since we have been prisoners, that many false and pernicious things, which were calculated to lead the saints far astray and to do great injury, have been taught by Dr. Avard as coming from the presidency, and we have reason to fear that many other designing and corrupt characters like unto himself, have been teaching many things which the presidency never knew were being taught in the church by anybody until after they were made prisoners. Had they known of such things they would have spurned them and their authors as they would the gates of hell. Thus we find that there have been frauds and secret abominations and evil works of darkness going on, leading the minds of the weak and unwary into confusion and distraction, and all the time palming it off upon the presidency, while the presidency were ignorant as well as innocent of those things which those persons were practicing in the church in their name." A lie once hatched, how long it lives! How easy it is for people to believe what they desire established as fact! How slight the evidence needs to be in support of an untruth, if only it ministers to their prejudices! Here is the testimony of this man Avard and of Marsh and of Hyde and of Phelps, respecting the existence in the church of the "Danite Band:" the first a traitor and perjurer, if his testimony before Judge King was true; for in that event he was under oath not to reveal that which he revealed, hence a perjured man. All the world knows the worthlessness of such a witness. It is not known how far Hyde's testimony supported Marsh's statements. He merely "knew some of the things" Marsh testified of, the rest he "believed to be true." After the church was safely settled in Illinois, Orson Hyde returned to the church, confessed his errors, made amends as far as lay in him the power, and was reinstated in the church and in his office. In later years he said in tears to his friend John Taylor, that he would give his life if only recollection of his support to Marsh's affidavit could be wiped out. Phelps in a deeply repentant spirit returned to the church in the summer of 1840; humbly made acknowledgment of his errors in Missouri, and was forgiven by the church and reinstated in his standing. Even Marsh returned to the church. He was baptized at Florence, Nebraska, in July, 1857, and the same year moved to the main body of the church in Utah, where for several years he lived upon the bounty of the very people he had betrayed, a poor, shattered, broken down old man. On several occasions, in public as well as in private, he said: "If any of you want to see the effects of apostasy, look upon me." Notwithstanding the testimony upon which the existence of the "Danite Band" in the church is of so questionable a character, given by men under the stress of fear and great excitement--men anxious to be received into the favor of the "old settlers," and of the militia and civil officers of the state, as the only means of finding security for themselves and families; notwithstanding most of the principal witnesses to the alleged fact, after the stress under which they testified was removed, confessed their error and returned to the church, begging forgiveness and seeking reinstatement; notwithstanding the fact that men within the church of the highest probity, of character denied the existence of this secret, oath-bound band of assassins within the church--beyond the existence of the society organized by Dr. Avard as explained in these pages, and which in no way received the sanction or approval of responsible church authorities, and "which died almost as soon as it was born"--notwithstanding all this, belief in the existence of the "Danites" in the "Mormon" church is quite general among non-"Mormons;" and every irregularity that has occurred in the church since these Missouri days, every act of violence in the frontier life of Utah, almost every militia movement in which "Mormons" have been engaged, has been set down as so many acts and movements of the "Danites." Murderers and desperadoes on the frontiers of the inter-mountain west ; as also the camp followers along the trails of the church from the Missouri river to the Rocky Mountains, have not been slow to recognize the advantage of having this alleged band of assassins on which they could load the responsibilities for their own crimes, and make the church the scapegoat for the sins of the mythical "Danites." Even people having fellowship in the church have sometimes been misled into believing in the existence of such a secret band, and in speech and in written word have treated the "Danite Band" as if it were a reality. Among non-"Mormons" in some quarters the "Danites" have become the hob-goblin terror of "old wives' tales," relating to the "Mormons and "Mormonism." They do not exist, however, and never have existed in the church with the sanction and authority of that church; nor with the knowledge and approval of the responsible officers of the church. The institution which God has founded--the church--to teach peace on earth, good will to men; to be a witness for him--of his being and the kind of being he is; to bear witness of the Christ and of the power of salvation in the gospel of the Christ; an institution which abhors murders and secret abominations, and whose chief scripture after the Bible--the Book of Mormon--repeatedly denounces such organizations as they existed among the ancient peoples whose history it contains--could never become the instigator and supporter of murderous, secret organizations, nor hope to prosper by robberies and assassinations. Bennett in his role of anti-"Mormon" agitator and lecturer revived his charges of unchastity against President Smith and the church leaders; alleged the practice of polygamy; the existence of the "Danites;" secret murders and designs for the overthrow of the government of the United States! Everything in fact which gave promise of creating a sensation. He finally published a book under the title The History of the Saints; or an Expose of Joe Smith and Mormonism. Two special sessions of the city council were devoted to an inquiry into the cause of alarm on the part of these men. It appears from the minutes of the proceedings that the trouble arose from some of the night guards discussing who the "Judas" was on whom the Missourians relied to betray the Prophet, with the result that suspicions had fallen upon William Law. This "talk of the street" had alarmed Mr. Law and his friends, and hence came the charges that the night guards of the city were under secret orders from the mayor and oath-bound "to put out of the way" those suspected of treachery to the Prophet; that the organization of "Danites" had been revived and a reign of terror was to be inaugurated. The existence of such conditions was stoutly denied by the mayor and many others. The night guards in a body and at each of the special sessions of the city council denied the charges of being oath-bound, or of having received other instructions than those given in open council by the mayor at the time they received their appointment. The complainants against the guards and the city administration appeared at a very great disadvantage at the investigation. 3rd. That the Mormon Government, with Brigham Young at its head, is now forming alliance with Indian tribes in Utah and adjoining territories--stimulating the Indians to acts of hostility--and organizing bands of his own followers under the name of `Danites or Destroying Angels,' to prosecute a system of robbery and murders upon American citizens, who support the authority of the United States, and denounce the infamous and disgusting practices and institutions of the Mormon government." The exposure of McMillan through the affidavits of leading citizens of San Pete county did not deter the gentleman from continuing his mendacity, for on the 31st of April, of the same year of his exposure, in the city of Denver, Colorado, he delivered himself practically of the same story. Indeed he was introduced by the local minister in Denver, Rev. Mr. Hayes, as "the man who carried the Cross into the camp of the Danites in the face of death, and preached the gospel of Christ with his hand on his pistol." McMillan on the occasion repeated the story of Brigham Young ordering his death, and of the assaults upon his house, when he "forgot he was a minister and thought only of his pistol!" Explanations of the Mormons' role have usually centered on the semisecret Danites, a group dedicated to unequivocal support of the Church leadership. Danites quickly expelled dissidents from Far West after Sidney Rigdon's "Salt Sermon" of June 17, 1838. Rigdon's July 4 speech appealed to constitutional rights but implied vigilantism as he condemned "vexatious lawsuits" and threatened "extermination" of persecutors. Few Saints seemed to notice the violation of apostates' constitutional rights or that non-Mormons could also appeal to vigilantism to protect their larger community from unwanted Latter-day Saints. The Missourians viewed the Danites as plunderers blindly following Smith's prophecy that God had given Missouri to the Saints for their "New Jerusalem." The Saints perceived the Missourians as bigots eager to drive out Mormons and obtain their improved lands. There was some basis for such exaggerations, but a deeper problem was the shared frontier ethos, which permitted, even encouraged, violence in certain situations. When legal appeals and diplomacy failed and conflict was joined, a war mentality melded militiaman with mobber, Saint with radical Danite. Examination of the conflicts of 1838 indicate both sides burned homes, threatened towns, and confiscated goods and animals. Each group justified such Acts as military necessity, self-defense, or proper revenge. About this time Sampson Avard, an apostate, secretly organized a company called Danites. The Church used all proper means to expose and counteract his schemes.